Assemblymember Mariko Yamada and Sikh American community leaders watch as Gov. Jerry Brown signs AB 1964. SACRAMENTO — AB 1964, Assemblymember Mariko Yamada’s (D-Davis) Workplace Religious Freedom Act (WRFA) of 2012, was signed by Gov. Jerry Brown on Sept. 8. AB 1964 strengthens California’s Fair Employment and Housing Act (FEHA) by protecting religious accommodation in employment. The bill enjoyed bipartisan support and interfaith cooperation throughout the legislative process and takes effect on Jan. 1, 2013. AB 1964, a number chosen to mark its relationship to the federal Civil Rights Act of 1964, makes three changes to FEHA. First, the bill removes the confusion between federal and state definitions of “undue hardship,” clarifying that California has a higher “significant difficulty or expense” hurdle for religious accommodation instead of the “de minimus” standard. Second, the bill specifies that religious clothing and hairstyles qualify as a religious belief or observance. Finally, AB 1964 prohibits an employer from segregating an employee from customers and the public to accommodate an employee’s religious beliefs. Changing demographics, both nationally and in California, have resulted in increased numbers of religious discrimination cases in the U.S., especially in the Sikh and Muslim communities. According to the Equal Employment Opportunity Commission, religious discrimination cases rose 9.5 percent in 2011, contributing to nearly 100,000 charges of employer discrimination nationwide. In California, employers faced over 500 such cases. 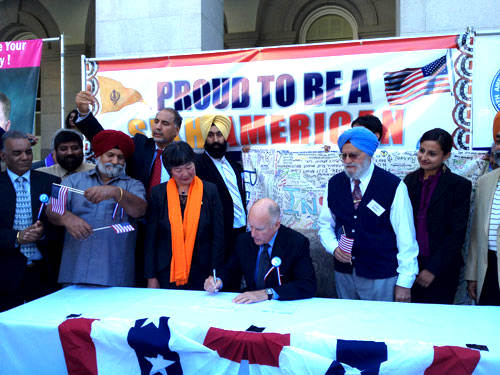 The signing followed Brown’s remarks at the North American Punjabi Association’s Peace and Unity Rally at the State Capitol, which was held to honor the victims of the Aug. 5 shooting at a Sikh temple in Oak Creek, Wis.
AB 1964 was supported by AFSCME, AFL-CIO, Agudath Israel of California, ACLU of California, American Jewish Committee, Anti-Defamation League, California Employment Lawyers Association, California Immigrant Policy Center, California Nurses Association, Church State Council, Consumer Attorneys of California, Council on American-Islamic Relations – California Chapter, Hindu-American Foundation, Japanese American Citizens League, and North American Religious Liberty Association – West. Brown also signed SB 1540, Sen. Loni Hancock’s (D-Oakland) bill requiring the State Board of Education to consider adopting a revised curriculum framework and evaluation criteria for instructional materials in history-social science. For full text of the bills, visit http://leginfo.ca.gov/bilinfo.html.